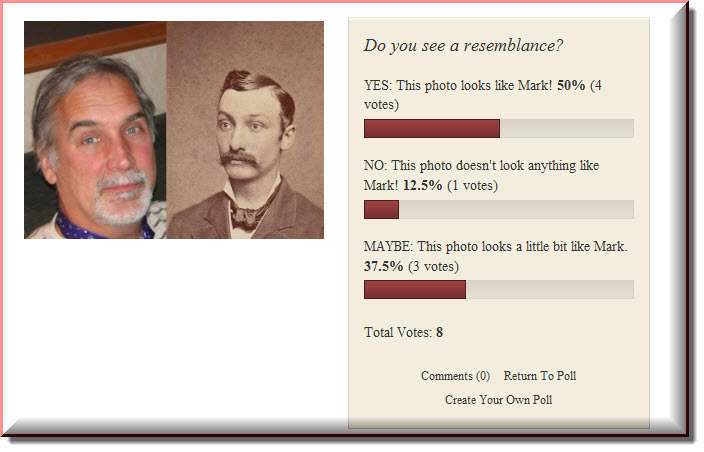 Just in case you haven’t checked the results of the poll lately that asks the question: Does our TRARES ancestor look an awful lot like my husband, Mark? MAYBE: 3 VOTES – We have several people in the “MAYBE” category. Personally, I think if I could have found a photo of a younger Mark to post the resemblance would have been more pronounced. Mark has put on some weight after more than five years of eating my cooking. He was rail-thin when he was the age of his TRARES ancestor. YES: 4 VOTES – Numbers don’t lie, folks – we have more “YES” votes than anything else. And in her email comment, even our newest TRARES “cousin” (Clare Myers) sees it, too! Check out her comment! If you haven’t voted yet, I suggest you scroll back to the poll and get your shot at expressing YOUR opinion! And thanks to Clare for the correction and I hope you cast your vote, too! This entry was posted in Family History, Photos, Polls, Trares and tagged Family Resemblance, Knapp, Trares. Bookmark the permalink.